The Large Hadron Collider is the world’s largest and most powerful particle collider, and the largest single machine in the world. 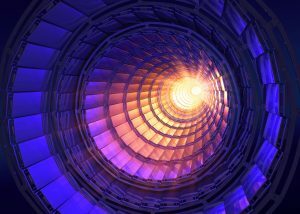 Working with the Large Hadron Collider, research happening right here in Dundee is helping to unlock some of science’s greatest mysteries including the “Big Bang”. For centuries light and its properties have fascinated scientists and philosophers, particularly with the discovery that light is both a particle and a wave. Our understanding of the way light interacts with matter has allowed us to create new ways of using light, ranging from spectacles to fibre-optic cables to lasers. Join us for this talk from Prof Amin Abdolvand (University of Dundee), an expert on the use and making of lasers. He will discuss the interaction of laser beams with materials, the fascination of changing materials using laser beams and why this topic continues to catch the fantasy of scientists and engineers. Join us at Café Science Dundee at Avery & Co. at 34 South Tay Street on Monday 14 May 2018, at 7pm. This is a free event and everyone is welcome. There is no need to book in advance but arrive early to avoid disappointment.